After the cable modem is successfully registered on the network, the Power, Upstream, Downstream, and Online indicators illuminate continuously to indicate that the cable modem is online and fully operational. For more details, refer to the Modem Lights section. 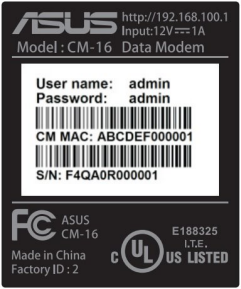 The Asus CM16 has the following ports available on the back of the modem. RESET - Use this button to reboot the modem or restore to factory defaults. It is recessed to prevent accidental resets. ETHERNET - Connects to the 10/100/1000 Ethernet ports on your computer. Solid Green None. The downstream channel is connected in DOCSIS 3.0 mode. Solid Blue None. High speed Internet connection with downstream channels in DOCSIS 3.1 mode. For more detailed technical information on the Asus CM16, use the resources below from Cisco.